Minneapolis / St Paul, MN: When buying a home, your credit matters. Credit scores and mortgage loan approval go hand in hand, and are one of the most important factors in the loan approval decision. With places like Credit Karma, and getting your credit score with your credit card statement, most people have a pretty good idea of where they scores average. But how does that score correlate to mortgage loan approvals, and what credit score do you need for loan approval? Understandably, the better your credit score, the more likely you’ll get approved for a loan, and the more options you’ll have. Also understand that credit score alone does not get you approved like it does in car loans. Mortgage loans still look at many other things, including debt-to-income rations, job stability, size of down payment, past bankruptcies and foreclosures, etc. 500 – 579 = Very limited number of lenders offer these loans. Very hard to get approved. Minimum down payment jumps to 10% for FHA loans. Rate easily .50% higher or more. Other factors also come into play, for example, most down payment assistance programs are not available with credit scores below 640. Clearly credit is important in the mortgage loan approval process. Always best do work on improving credit before applying for a home loan. Ready to apply? 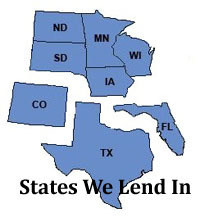 For home mortgage loans in MN, WI, and SD, just click here to get started. The Digital Mortgage truth is much different than the hype. Minneapolis, MN: It is 2018. The number of people who physically step into a bank or mortgage lender to do a home loan application is dwindling everyday. The vast majority of complete an online loan application on a desktop computer or iPad, or even apply via a Smartphone. Technology allows lenders to do more parts of the process electronically that ever before, including electronically signing application documents, secure uploading your documents, and even apps that shows the current status of your application 24/7. Very cool technology, with this process now commonly referred to as a ‘Digital Mortgage’. I see many places claiming using a digital mortgage will save you a ton of money. Mainly because somehow this streamlines the process, blah blah blah. Taking the loan application online is only one small part of the mortgage loan process. You still need to supply W2’s, pay stubs, bank statements, tax returns, etc. We still need processors, underwriters, and a large number of back office staff. While yes, we can now get some of these documents electronically, I haven’t done a single loan yet without needing the client to supply at least s half of these standard supporting documents themselves. You still need, and still want to have a conversation with a licensed professional Loan Officer to discuss your wants, needs and goals. To analyze your situation, to determine the correct loan for you, to answer any questions, and walk you through the process. Yes, you can complete a loan application in 10 minutes on your phone, but that is a long long long way from being fully approved and actually successfully closing a mortgage loan. There is no fast rocket way to circumvent the bulk of the mortgage process. So don’t be fooled or make a lender choice simply because of a gimmicky claim of a digital mortgage process. That just isn’t reality – yet. It is the largest financial transaction of your life. Don’t entrust it to your cell phone. The dangers of dual agency real estate transactions, and using the same real estate agent to buy your home that is also selling the home is a little more troubling than most home buyers are aware. It’s common to walk into an Open House, look around, and start talking to the real estate agent listing the home. If you don’t already have your own agent, but love the home, you may be tempted to just use the agent selling the house. While completely legal, and while it may seem OK on the surface, it is wrought with possible issues. The first thing to know is that real estate agents commonly refer to this situation as a ‘hogger’. This simply means they get to keep all of the commission the seller is paying for themselves when they represent both the seller and the buyer. Typically when there is a separate buying and selling agent they split the commissions. On a pretty standard 6% listing fee, the listing agent would keep 3.3% of the commission, and pay 2.7% to the buyers agent. If they can double their pay, an agent might be over incentivized to close a deal no matter what. Many buyer think that a dual agent will reduce their commissions, saving them money. While they can do this, it rarely even happens. But the bigger concern element is that the duty of the agent in this situation is to the seller. They have no duty to the buyer. An example would be that the agent knows the seller is willing to take $10,000 less on the house, but the agent has no duty whatsoever to tell share this confidential information with you just because you are using the same agent. Also, without your own agent, you have no one advising you if the listing price is even reasonable. If you have your own agent, your agent will generally review similar properties to tell you if this one is priced low, about right, or high. The listing agent will likely defend the listing price as it, meaning you could easily over pay for the home. TIP: Although you may feel like you have to make the decision whether to accept a dual agent on short notice, don’t be tempted. It’s possible to find a buyer’s agent to step into the transaction and assist you in a matter of hours. Best to always have your own buying agent. Someone fighting for YOU! If I’ve pre-approved you for your mortgage loan, I’ve worked with hundreds of good real estate agents in the Minneapolis / St Paul area, and can easily get a great one to call you right away. A much lesser known, but to me more troubling issue is that when you hire a real estate agent to list your home, and the same company represents the buyer, your agent is prohibited by law to negotiate on your behalf? Yes, its true. It is because of a Minnesota law called ‘Dual Agency’, and companies with hundreds or even thousands of real estate agents end up having many ‘in-house’ transactions. This forces sellers to sacrifice their exclusive representation because even though you have two different agents, they work for the same company. Before entering into any of these types of dual agency agreements, however, you want to understand the legal implications and how it might affect your ability to get the best possible deal in buying or selling a home. You’ll see dual agency notifications in the piles of paperwork you sign when making an offer, but virtually no one buying a home understands what it means. Minneapolis, MN: The biggest challenge for most home buyers, especially first time home buyers, is coming up with the required down payment. While most people understand down payment, they are shocked to learn their are mortgage closing costs. Wose yet, is discovering how much closing costs can add up to. Mortgage loan closing costs cover many items, including appraisal, credit report, state deed taxes, title company costs, title insurance, lender costs, and more. Plus you also have something known as pre-paid expenses which need to be paid too, including buying your first years home owners insurance policy, and one time pro-rated property taxes, which are based on when property taxes are due, and what month you close on your new home. While closing costs and pre-paid items are actually separate, it is very common for people to combine both of them together, and simply say ‘closing costs’. I hear it day after day after day, that closing costs are around 3% of the purchase price. This generalized statement couldn’t be more wrong! Closing costs vary based on many factors, including the homes purchase price, state, property taxes, loan program, and the buyers choice of how to pay for them. This misinformation comes from the fact that conventional loans only allow for a home buyer to roll into the loan closing costs up to 3% of the purchase price. Many loan closing costs are based on the loan amount, and the rest are the same regardless of the homes price. For example, standard loan origination costs are 1%. So 1% of a $100,000 loan is just $1,000, while a $400,000 loan of course equals $4,000. Items like the appraisal may be the same for both the $100,000 home or the $400,000 home. While the cost is the same for either house, the $400 appraisal fee is 1% of a $40,000 home, but only 0.10% of the $400,000 home. Another good example are Title Company charges. Standard Title Company closing fee is usually a flat fee, but the required title insurance varies based on purchase price. Mathmatically, the best way to pay for your loans closing costs will always be to pay cash out-of-pocket. Realistically, especially for first time home buyers, this makes the amount needed out of reach. Mortgage loan programs always require you bring your down payment, but closing costs can be rolled into the loan a few different way. I dislike the term ‘Seller paid closing costs’, as many people thing the seller is paying it, and therefore it is free. The reality is that while the purchase agreement says the seller is paying, the person actually paying is the buyer. You are just paying over time. For example, assume the seller has listed the home for $200,000. You make a full priced offer at $200,000, but your offer also asks the seller to pay the maximum conventional loan allowed closing costs of 3% ($6,000). If the seller says YES, many people think you got closing costs for free. But think about it. The seller actually netted just $194,000 in their pocket. So you could have made an offer for $194,000 and paid your own closing costs. The seller got $194,000 either way, but you rolled your closing costs into the loan, opting to pay the costs over time, versus up-front today. Lender credits is another tool. With lender credits, the lender will increase your loans interest rate in exchange for reducing your out-of-pocket closing costs today. You can choose a small rate increase with a small lender credit, all the way to absolutely no closing costs whatsoever with a much larger rate increase. You may also see lender credits employed in a different way too. For example, many lenders will scream things like ‘no lender fee’, or maybe ‘free appraisal’ if you use them. All they are doing is increasing the interest rate a bit to offset normal costs – but not telling you. The most common one we see is no loan origination options, which will generally increase a 30-year fixed rate loan by 0.25%. ARE LENDER CREDITS GOOD OR BAD? Increasing your loans interest rate never sounds good, but does thing make lender credits bad? Think of them as a financing tool, and your personal situation? Do you have the cash to pay your own closing costs? Maybe you have the money, but would rather use it to improve the home. Lenders credits might still be a good choice. Do you not have the money? Then it may be a matter of using lender credits, or not buying the home at all. In this case, a small amount all the way to complete no closing costs via lender credits may be your sole option. Maple Grove Minnesota based Mortgages Unlimited is proud to announce that for the 3rd year in a row, they have been named a Star Tribune Top 150 Workplace in Minnesota. Mortgages Unlimited, in business since 1991, is one of Minnesota’s top non-bank Mortgage companies offering a full suite of home loan products, including, but not limited to standard conventional loans, FHA loans, VA loans, USDA rural loans, investment properties, jumbo loans, first time home buyer, down payment assistance, and even bank statement for proof of income loans. Equal Housing Lender, NMLS 225504. What happens if the house appraises for less? Congratulations. You’ve enter the housing market, gotten mortgage pre-approved, and made a successful offer on your dream house. But what happens if the house appraises for less than the purchase price? There are many reasons why an appraisal may be low. In rapidly changing markets, home prices continue to increase which is something makes it difficult for appraisers. Maybe the agent made a mistake. Maybe the buyer pressured the agent to list it higher than it should have been. Maybe the appraiser made a mistake. Maybe multiple offers drove the price too high. Maybe the buyer needing to roll in closing costs pushed the sales price over the market value. Who knows. It happens, and it happens a lot more often than buyers and sellers may realize. There are many other reasons too. If you get the news that the appraisal came in lower than the sales price, don’t panic. Almost all of the deals still close! Understand the whole idea of the independent appraisal is that an unbiased, highly trained third party is there to protect the buyer and the lender. The buyer doesn’t want to pay more than fair value, and the lender is obviously concerned about their collateral. So What To Do If The House Doesn’t Appraise For the Sales Price? The first thing is to review the appraisal to see if it has obvious errors. I’m not talking opinion of value differences, I am talking actual errors. For example the house is 3000 square feet, and the appraiser has it at 2400 square feet. Assuming an error, bringing it to the appraisers attention usually results in a quick fix. TIP: If there is a measurement error, 99% of the time, the listing had the size too big. Few agents actually measure, while 100% of appraisers measure. Have the agent gather what they believe are better comparable properties than the appraiser use. Don’t just give addresses. Give a detailed explanations of why they believe the appraiser should consider these homes instead. TIP: Rare is it that the appraiser didn’t already consider the comparable you just submitted. If there are obvious errors, or obvious poor comparible choices, there is the possibility of obtaining a new appraisal with a different appraiser. There are rules and guidelines to this process. It is not an easy route, plus the buyer would need to pay for the 2nd appraisal. Options to make low appraisal deals still work? Typically there are four routes when the appraisal is less than the sales price. Walk away. Any agent worth anything has written an appraisal contingency in the purchase agreement. This happens maybe less than 2% of the time. Buyer can pay cash out-of-pocket for the full difference between the purchase price and the appraisal. The down payment and all loan parameters will be based off the lower appraisal. This happens maybe 3% of the time. Seller drops the sales price to match the appraisal. They may piss and moan, but this happens in probably 70% of the cases. This is because cancelling doesn’t work for anyone, and putting the house back on the market is no guarantee you won’t get a similar appraisal down the line. Seller and buyer split the difference somehow. A common route is the seller lowers the price a bit, and the buyer pays a little more out-of-pocket. Another common route is that is the seller was paying some of the buyers closing costs, maybe they reduce or eliminate seller paid closing costs. This options happens maybe 25-% of the time. Hopefully my math worked out to 100%, but as you can see, most real estate transactions that have an appraisal come in low still get to the closing table. When buying a new home, not only do you have to find that perfect home, you also need to find that perfect mortgage loan. Many people use the internet to learn about loan options, terms, rates, and cost options. It can easily become overwhelming. It helps to have some basic understanding of loans, so when your Loan Officers discusses options, you can help us choose the right loan for you and your family. Fixed-rate mortgages (FRM): Straight forward, as you pay the exact same monthly payment for the entire loan term. Taxes and insurance changes might change your monthly payment, but the loan itself doesn’t change. Common fixed rate loan amortization terms are 30, 25, 20, 15, and 10-year terms, with 30-years being the most common. Standard conventional loan: The plain Jane of the mortgage world. Nothing fancy, tried and true. Down payments starting at 5% down. VA Home Loan for active or former U.S. Military personal has no down payment requirement up to the local conforming loan limit. Above the local limit, a small down payment is required. VA loans also do not have monthly mortgage insurance, making them one of the best loan options available. The USDA Rural Housing loan is also no down payment, but is available to anyone. Their are income and location guidelines (house must be rural for example). First Time Home Buyer Loans: These options typically allow for smaller down payments, like just 3% down, and generally also offer reduced mortgage insurance. A first time home buyer is defined as someone who has not owned a home in the past 3-years. Typically you must attend a first time home buyer education class to get these loans. FHA Loans are a long-time favorite, as they typically allow for lower credit scores, and have only a 3.50% down payment requirement. Down Payment Assistance Loans fit a popular situation, where the home buyer has OK enough credit, and can afford a house payment, but they just never seem to be able to save enough for a standard down payment. You usually need to put a little of your own money for a down payment (typically $1,000), and you get an assistance loan to cover the rest of the standard down payment. Home buyer education classes, and household income limits apply. As one can imagine, there are many variations to these basic programs, and this article only focuses on purchase loans. refinance loans can be different. My best advice is to not try to figure it out yourself, rather simply complete an application with a local experienced Loan officer, who can review the file to look at all options, to zero in on what loan is best for you.